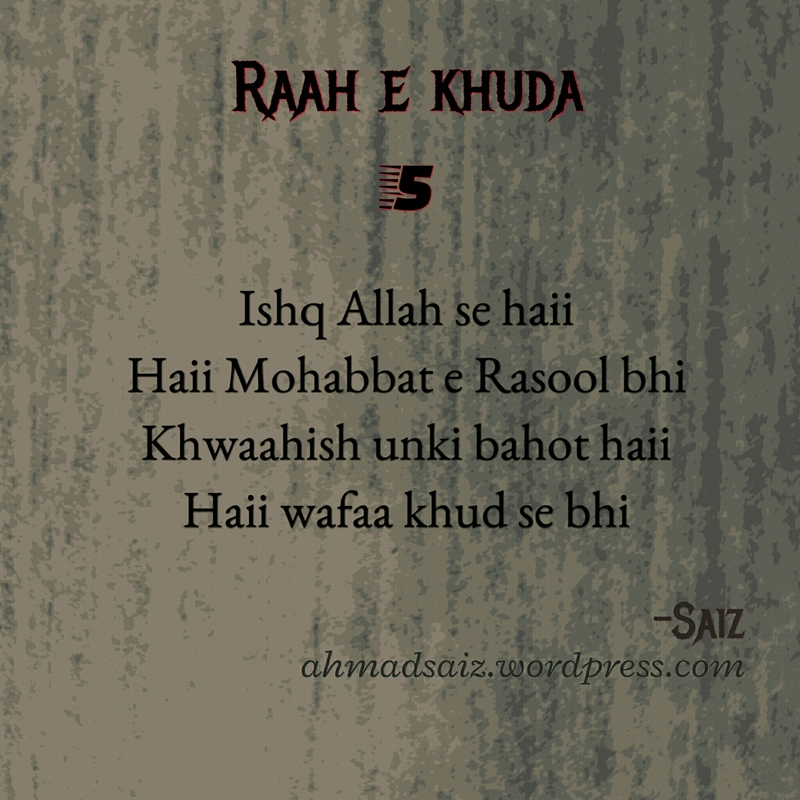 Raah e Khuda: #5. ~Ishq…~ – I'm Here; Right Here. I wonder a lot. Not because I am so lame to do other things in life. But, that’s what makes me jot down the most of my imaginations on paper. I fantasize this aspect into my Urdu Poetry to a much greater extent. To keep it real, I talk about love. And what is the love of any human in comparison to the love of Allah and His beloved Messenger jointly. I remember a Hadeeth of Prophet Muhammad(Sal’lal_lahu A’lai_hi Wa_sal’lam) upon Love. Hadeeth is a saying of Prophet Muhammad (Sal’lal_lahu A’lai_hi Wa_sal’lam). Its a quite long say. But, I would like to mention the excerpts of it in a summarized form. “When Allah loves His slave, He calls upon Angel Jibreel(A’lai_his’salaam) and says, ”O Jibreel! I Love that slave of Mine. You must love him too. Then Angel Jibreel(A’lai_his’salaam) calls upon all the angels of the seven Heavens including those of the Arsh too and ordains them to love this slave of Allah because Allah loves him. Then Allah makes the heart of those people amicably innocent who stay or live around this slave of Allah. The people around him also start to love him for the sake of Allah. (And the Hadeeth continues the same for the slave whom Allah hates. And the opposite happens in that case. This trembled my heart after I read it. The purpose of my mentioning this Hadeeth was to make us focus upon loving Allah so that we find no spare time to hate Allah. As we have only a couple of dozen hours in a day. If we keep ourselves busy in doing the deeds which Allah loves(i.e. Halal), we surely ain’t finding the time to do those deeds which Allah hates(i.e. Haram). Enough said. Lets get back to the last of the Urdu Poetry onto this very section. It was about love; so I thought of speaking up upon love to a bit. This Urdu Poetry depicts how I define love. Hope you could feel the same way as I do. So, here I end this streak on a high five. Wah this was just beyond awesome! I like the fact that you explained a bit before your poem. I am so much happy. That I did not let you down by inviting you at my blog. Thanks so much. That explanation thing is what I love too. Not at all enjoyed alot here. Welcome.It gives more sense to the whole poem. Ah.. I was scared though. You being at the top and me an amateur showing you my poems was quite odd at hand. Oh no it is actually the other way round! Subhaan Allah this is beautiful, the best among the ones have read till now!! Wallah! mashaALlah! may Allah preserve your pen and bless your works.. Aameen!!! This Hadeeth is one of my favorites. I tried to keep this one as short as possible. Thanks for sharing the hadith. I wasn’t aware of Allah disliking his slave but I have heard of the hadith on which Allah likes his slaves tells Jibraeel (A.S) who tells other malaika etc. I am planning to write about Hadiths and Stories of Sahaba and the Prophets in my style of writing. How about this idea? Shall I? Yes please. That’s a brilliant idea and you will get so much ajr and thawaab. I got this idea long time ago. I had already planned a few drafts of these too. Thanks a lotz….I shall be going great with these ones. You are really very kind. Same here. University exams coming up, assignments and studying. Which is why I thought its better you do the posts by yourself and not collab because I was unsure if I could give you my time. But take your time and post it when you are a bit light on the schedule. No stress. All the best!! Yeah sure will I take time! Just letting all this pass. Thanks for the wishes. Good Night! Oh yeah I forgot it would be late night in India!! Oops. Sorry to disturb. Its early morning here in Aus and I tend to forget about other’s timings. Good night. A writer thing you know! It’s rare to see people who like and write Urdu poetry in our times… I must say I am impressed. I wonder if you are as good an Urdu writer as you are to English! How do you learn it btw? Well I am doing my majors in Islamic Sciences from Princess Noura University, Riyadh, Saudi Arabia. Everything here is in Arabic. You must love Urdu too! Fill us in about the details and how we can help you. If you want you can contact us through our email too. I shall drop in a mail to you.